The School Works Program is targeted at creating career-related work opportunities for students to gain meaningful work experience and provide strong benefit to participating employers. Please ensure you review the job requirements closely in the School Works Application Guide. Read the School Works Program Application Guide here: Application Guide. Complete the School Works Application Form online. Detailed instructions will be posted when the program opens on August 16 at 1:00 pm PT/2:00 pm MT. 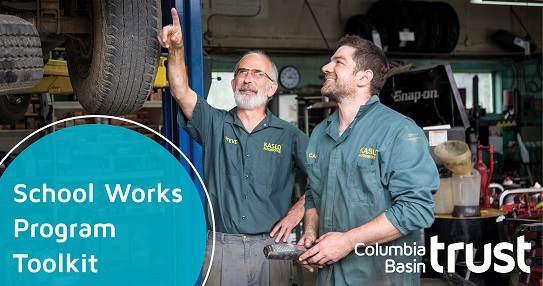 School Works: Apprentice Wage Subsidy provides a wage subsidy to businesses, non-profit or First Nations organizations, or public bodies in the Columbia Basin to meet their employment needs. Read the School Works: Apprentice Wage Subsidy Application Guide here: Application Guide.